Apparently it is a rainy day outside and I am rooted to my recliner with my computer. I keep thinking that I’ll get up and do something… but then I think, “why?”. We had a productive week. I’m going to take this rainy day and rest! Well… why not create freebies while I rest??? These fun boxes can be used for planners, as bookmarks, and much more. How will you use them?? These boxes can be used horizontally or vertically in your favorite planner. They are sized 4.5 inches by 1.5 inches. This is a FREE printable! How does that work, you ask??? – Save to your computer so you will ALWAYS have these fun stickers on hand. – cut out your stickers, add to your planner, and plan away! 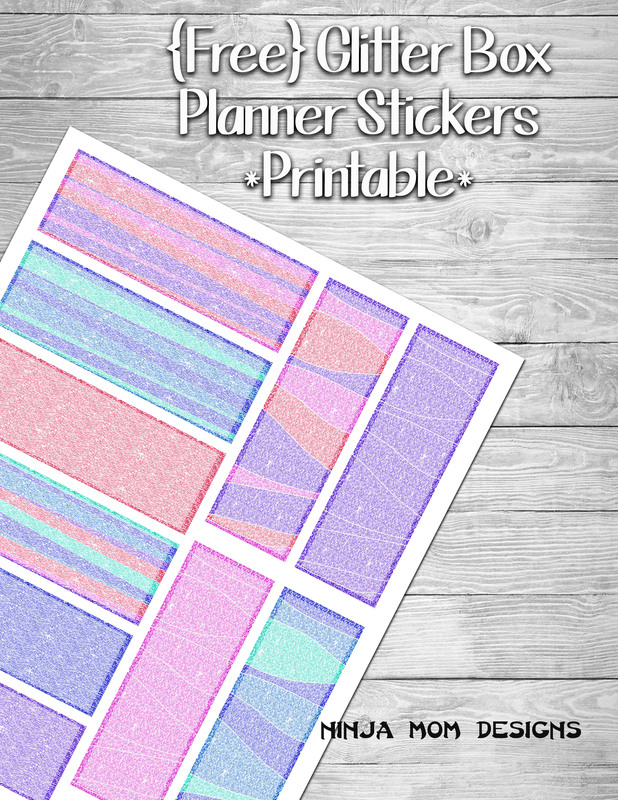 Be sure to check out the Other Print at Home Planner Stickers from Ninja Mom Designs! How will you use this FREE PRINTABLE?!?! If you print and use these in your planner, tag @ninjamomdesigns on Instagram so I can see them. I love to see other people using my FREE printables. I would love to be inspired by you as well! You may not re-sell, redistribute, or claim the designs as your own. If you post this on the internet, PLEASE give credit to Ninja Mom Designs and link back to my website (www.ninjamomdesigns.com) so others can obtain the file from the ORIGINAL source. If you have a concern about the material being shared for any reason, please contact me right away so that it can be dealt with appropriately.